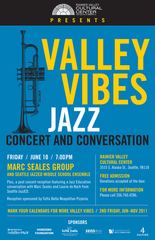 The Valley Vibes Jazz Concert and Conversation Series opens Friday, June 10, 7pm, with the Marc Seales Group and the Seattle JazzED Intermediate Ensemble at the Rainier Valley Cultural Center (RVCC), 3515 S. Alaska Street, Columbia City. Admission is free or by donation. For two decades, in-demand pianist, composer, and educator (University of Washington) Marc Seales has served as a mentor to young talent. He is a leading jazz figure in the Northwest and has toured and performed with many jazz greats, including Don Lanphere, Joe Henderson, Art Pepper, and Bobby Hutcherson. Seales performs June 10 at RVCC in his sextet ensemble, which includes bassist Paul Gabrielson, drummer Steve Korn, and percussionist Lary Barilleau. The Seattle JazzED Intermediate Ensemble is led by Robert Knatt, the award-winning former jazz instructor at Washington Middle School. 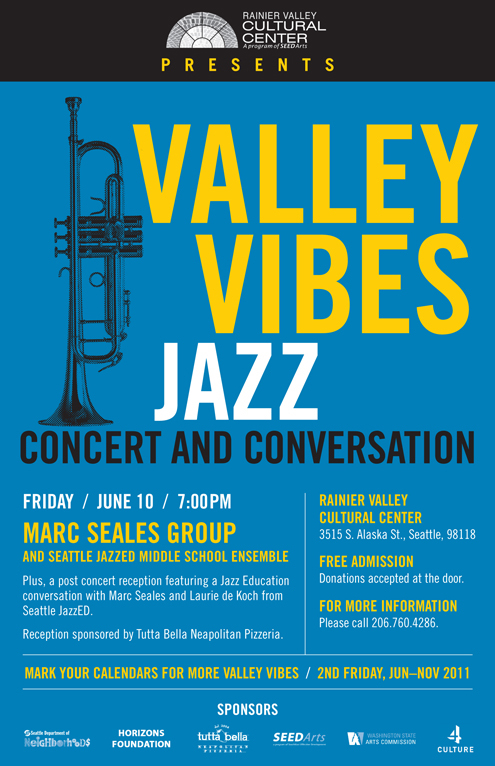 The ensemble comprises sixth, seventh, and eighth grade students from around the region and showcases Seattle JazzED's commitment to providing access to Seattle's nationally acclaimed jazz educators for all children. Seattle JazzED's executive director and co-founder, Laurie de Koch, former development director for the Seattle Youth Symphony, joins Marc Seales after the performance for a community conversation about jazz education in the region, with beverages and hors d'oeuvres provided by Tutta Bella Neapolitan Pizzeria. The Marc Seales and Seattle JazzED ensemble double bill and community conversation marks the premiere of the Valley Vibes Jazz Concert and Conversation Series, a free program held on second Fridays, June-November 2011, at the Rainier Valley Cultural Center, 3515 S. Alaska Street, Columbia City. Valley Vibes fosters a vibrant community core in diverse Southeast Seattle through publicly accessible arts and conversation. The series is produced by SEEDArts and coordinated by Earshot Jazz, with funding provided in part by a Neighborhood Matching Fund award from the Seattle Department of Neighborhoods, the Horizons Foundation, Washington State Arts Commission, and 4 Culture.